Orlando Thomas Lockyer "Lanty" O'Brien. The O'Brien family was a victim of the Potato Famine in Ireland. Although relatively wealthy, the father Thomas, who was a solicitor and a land owner, was unable to support his family or his tenant farmers once the potato blight hit. Husband and wife and seven children (Orlando being the eldest boy aged 9) set off to Melbourne via Liverpool on 5 June on the "Saldanah" (1562 tons) and arrived at Port Melbourne 17 September 1856, as part of the ship's 518 passengers. The trip took 103 days, it was found that the ship was leaking soon after departure and the captain had difficulty in keeping the ship afloat even with the aid of two pumps which were in continual operation. The ship's company's burden was finally relieved when the vessel anchored in Hobson's Bay.
.*Lanty would have been approximately 11 years of age. However the ship's passenger list had Orlando as aged 9. The Australasian reporting on his death in January 1911 said he was 65, so that would put his year of birth as 1845 or 1846. The family's descendants are not sure where the nick-name "Lanty" came from whether it was a corruption of "Landy" short for Orlando or whether is was a newspaper mispelling which somehow stuck. One item of interest which Lanty had kept and was handed down in the family was a copy of the first Carlton Football Club Rules. Unfortunately for all, this treasured family possession was left by his son Thomas on a train in Perth! A Pioneer player in 1864. "The first and only punter for years" and among the leading player for 1867. 1868 The Argus has O'Brien named in the Carlton side to play Geelong on Monday 25th. May. O'Brien named in squad to play Emerald Hill at Emerald Hill, Saturday 6th. June 1868. 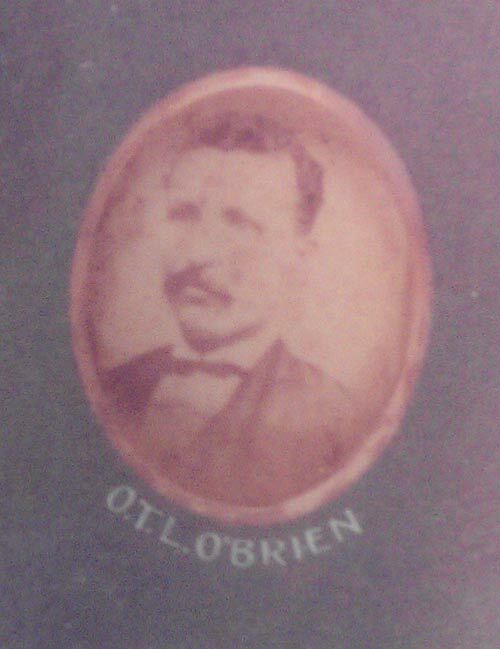 1875 "Lanty O'Brien" an old and distinguished player, is remarkable for his punt kick. Lanty O'Brien and Harry Guy took to the field for their old club when the Blues were two players short for the game against Melbourne at Royal Park. Described as the longest kick in the competition. To celebrate Carlton's 1906 Premiership victory Carlton veterans Lanty O'Brien and Fred Gunn attended the President's Smoke Night held in the Manchester Unity Hall on November 29. The Age footballer writer who went under the pseudonym "Follower" wrote an article celebrating the 50 years of Australian Football. "...and O.T.L. O'Brien ("Lanty") who joined Carlton in 1861, the year of it's formation, and who has for many years been, and still is, one of the best known officers of the Customs department, was the first man to introduce the 'punt'." Of the smoker lying in Dog-leg Lane alone. That a Word fell crisp from the lips of Lanty O'Brine. While somebody said: "The beggars 'ave 'ad their joke." For the joke the Chinamen worked on Lanty O'Brine. 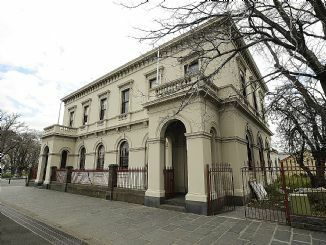 Orlando Thomas O'Brien passed away aged 64 years, at his residence the Customhouse, Williamstown. Husband of Margaret M. O'Brien, father of Thomas (W. Aust. ), Naughton, Cissy, Francis, Iolene, and Mrs. Foster. "In his younger days Mr. O'Brien was one of Melbourne's champion footballers. He was a member of the original Carlton team, and the "inventor" of the "punt" kick. He leaves a widow and grown up children." The funeral of Lanty O'Brien proceeded from the Customhouse Wiliamstown, via train to the North Melbourne station then to the Melbourne General Cemetery. "Old Carltonians will read with much regret the announcement of the death of O. T. L. O'Brien. he was a well known footballer in the early days of the Carlton Football Club, and 'Lanty' and his 'punt' in the course of seasons became familiar as household words. In the Carlton pavilion there is a group of old footballers and amongst them is 'Lanty.' Looking at his photo, you would say that he, at all events was ready for the fray. 'Fierce in his eye the fire of valour burns.' Everyone liked him. He was a fine, manly player, game as a pebble, and full of kindly spirit and good nature. In short, he was one of the best of all good fellows. He played with Harry Guy, Tom Gorman, W. Williams /Bill Williams, W. Monie /Billy Monie, Tom McCarthy, Frank Willsden /Frank Hillsden, George Robertson, Colonel Robertson /Robert Robertson, Billy Lacey, M. Webb /Mick Webb, and even C. Forrester /Charles Forrester and J. Byrne /James Byrne were Carltonians when 'Lanty' first wore the orange cap of Carlton, in the sixties. His death was due to a chill and resulting complications. he attained the age of 65 years." The Adelaide Advertiser reported "Lanty" O'Brien's death. "Mr. O'Brien was formerly one of Melbourne's champion footballers. He was a member of the original Carlton team, and the "inventor" of the "punt" kick." "Mr. T. O'Brien of the Post Office Cricket Club, has just received news of the death of his father, Mr. Orlando O'Brien, better known to sportsmen, and particularly footballers, as "Lanty" O'Brien. The deceased gentleman was one of the originators of the Australian game of football, and he was captain of the first team to proceed to New South Wales in 1878, with the object of introducing the game into that state. He occupied at one time the position of captain of the Melbourne Football Club, and also led the Carlton team to victory on many occasions. He was an all round sportsman, an adept at handball, and in one year he won the Civil Service Cup for rowing. He was always known in football circles at the "left punt kick." Mr. O'Brien had occupied the position of Chief Tide Inspector of Customs for 20 years, and he had been altogether 42 years in the service of the Government. It was his intention at 60 years of age to tour the world, but he was so hale and hearty at that age that the trip was postponed, and after six weeks of illness he died at the age of 65 years. The deceased gentleman was noted for the number of lives he had saved in Hobson's Bay. He always made his bed under the telephone, and was ever ready to render assistance when called upon. Mr. O'Brien leaves three daughters and three sons to mourn the loss of an estimable father, and he will be sadly missed in shipping circles in Victoria." More than 150 years have passed since Lanty O'Brien's first connection with the Carlton Football Club. Late in 2015 Lanty's great, great, great grand daughter Emily Angwin was appointed as Carlton's Media Presenter. Although she is a Collingwood supporter, Lanty would have been bemused, as the present Collingwood club was at least a further 28 years into the future when he first played the game for Carlton. Page last modified on Tuesday 10 of October, 2017 12:34:32 AEDT by blueycarlton.